Choosing joy in the midst of great adversity and difficult circumstances never comes “naturally”. Joy is a gift readily available! Great trials can be matched by equally great joy according to James 1:2-4. That first word implies there is something to take into account. It has the sense of “commanding with official authority”. There was a season of pressure I was facing when every morning before my feet hit the floor my declaration was, “Today, I choose joy!” The situation ahead was the exact opposite. My emotional survival demanding a choice of action; my choice was joy. That choice made all the difference in my two-year trial. Neither James, nor I, am making lite of trials. The intensity and duration is unpredictable and often severe. Trials are to be “faced“. Years ago a fierce storm hit our farmyard with pounding rain and hail accompanied by flashes of intense lightning. A small group of tame ducks were caught outside in the midst of it. I expected them to run for shelter or hide their heads beneath their wings. They stood together in a small cluster facing the wind and torrent with heads held high. The image spoke to me then and continues to speak now. They faced the storm. There is something we need to “know” in the midst of trials and tests. “James jogs our memory just a little. Trials have purpose! In school tests were inevitable. A test demonstrates both what we know and what we don’t know. Trials show the Anchor and Substance of our faith is Christ alone! The only way for me to find joy in the midst of my greatest trials and sufferings is to hold on to an eternal biblical perspective. Here is found that cheerful, even hopeful, endurance and constancy that gives strength and fortitude to rise above. My trial my last a life time, but it won’t follow me to heaven! We will all get knocked down. Knocked down again? Get back up! We’ll take jabs to the jaw! Get back up! We’ll take a few in the back. Get back up! When we hit the pavement hard? Get back up! This is perseverance – living with deliberate purpose and loyal to the faith, in the greatest trials and sufferings. We always have choice. It is easier to give in than to get up and be knocked down again. Far easier! I’ve talked before about finishing well; perseverance helps me to just that. If we “let” or allow the trials we face to finish what God is doing, the result will be maturity and completeness. One can trust a mature person. Their wisdom, strength and tenacity helps them to stay the course. Think about what being complete and perfectly sound would look like. When Peter healed the lame beggar, the word used is the same as this one in James. Legs and feet once none responsive now jumped, leaped and walked to places forbidden just moments before. chains of confinement broke into freedom! 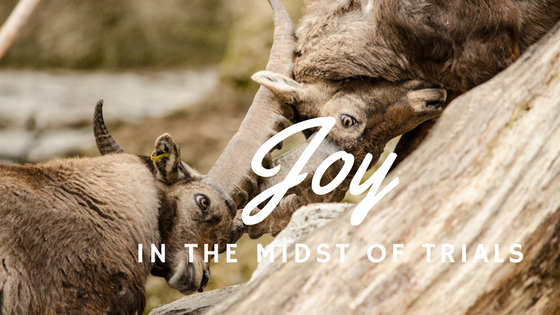 When we know, as James and the early church knew, in the midst of intense persecution we too can face trials with great joy – wholly joyfully! God is working! He is producing in us a tenacious faith bearing fruit of maturity and bringing us in to a realm of neither lack or deficiency. That very thought is enough for me! ← Martha, Mary or Lazarus, Which Worshipper are You?